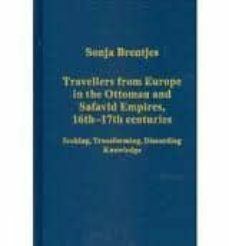 This collection of Sonja Brentjes' articles deals with travels, encounters and the exchange of knowledge in the Mediterranean and Western Asia during the 16th and 17th centuries, focusing on three historiographical concerns. The first is how we should understand the relationship between Christian and Muslim societies, in the period between the translations from Arabic into Latin (10th - 13th centuries) and before the Napoleonic invasion of Ottoman Egypt (1798). The second concern is the 'Western' discourse about the decline or even disappearance of the sciences in late medieval and early modern Islamic societies and, third, the construction of Western Asian natures and cultures in Catholic and Protestant books, maps and pictures. The articles discuss institutional and personal relationships, describe how Catholic or Protestant travellers learned about and accessed Muslim scholarly literature, and uncover contradictory modes of reporting, evaluating or eradicating the visited cultures and their knowledge.